Today’s Bible readings are from Exodus 38, John 17, Proverbs 14 and Philippians 1. Exodus 38 presents the construction of the altar (38:1-7) and laver (38:8), then the courtyard (38:9-20). The rings and poles (38:5-7) made the tabernacle portable. They were not supposed to stay in the Sinai desert, but move to the land God had promised to Abraham. The materials to build the tabernacle included slightly over a ton of gold (v. 24), almost four tons of silver (vv. 25-28), and about two and a half tons of bronze (vv. 29-31)! John 17 is the high priestly prayer of Jesus. This is more “the Lord’s prayer” than the one Jesus taught His disciples to pray. Jesus begins by praying for himself (17:1-5), asking the Father to glorify Him now in death and resurrection as He had shared the Father’s glory in eternity past. Then He prays for His disciples (17:6-19), who had been given to Christ by the Father and He now asks the Father to keep them and sanctify them. Finally, the prayer telescopes out to all others who would believe on Jesus through their message (17:20-27). He prays for their unity and that they would be marked with glory. Verses 5-7 refer to character manifested, in part, through speech: the faithful vs. false witness (v. 5), the scoffer (v. 6), the lack of words of knowledge from a fool (v. 7), and the implication that such words can be found with a man of understanding (v. 6). Verses 8-15 is framed by verses that contrast the approach of the prudent (vv. 8a, 15b) with that of fools (v. 8b) and the simple (v. 15a). It is prudent to recognize that appearances can be deceptive (a person’s exterior vs. the state of the heart, vv. 10, 13; the solidity of the house vs. the tent, v. 11; and a way that seems right, v. 12) and that whatever the appearance, the path of one’s life has consequences consistent with how it is walked. The wise gives thought to his path and turns away from evil (cf. ESV footnote on cautious with the use of this phrase in 3:7; 16:6). In contrast, the fool is reckless on his path (14:16b), a quality of heart that is aggravated further by a quick temper and results in his being hated (v. 17) for its ruinous effects. The apostle Paul wrote this letter to the Christians in Philippi, probably from Rome c. A.D. 62, while he was under house arrest. 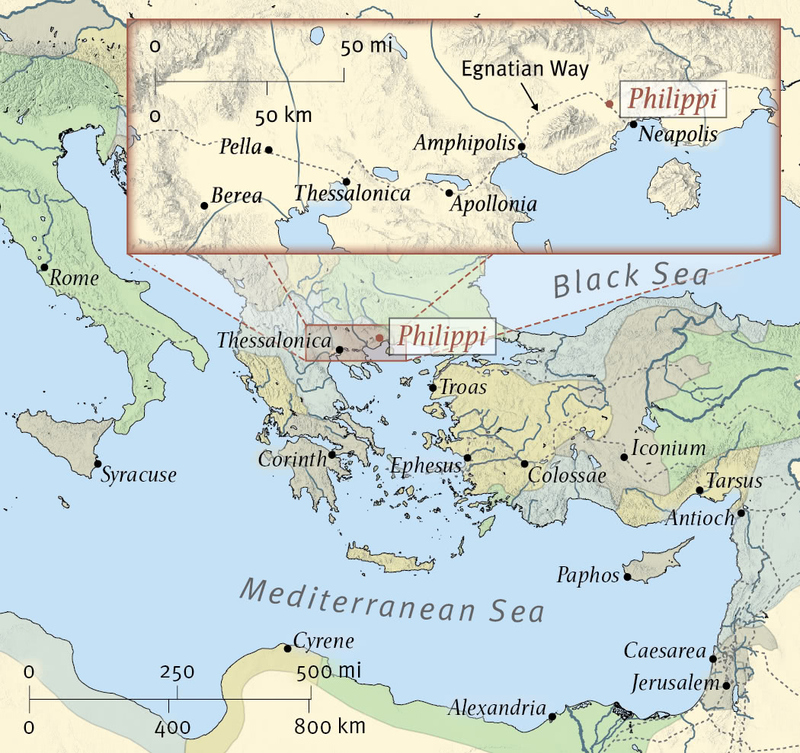 Philippi was a wealthy town, thanks to nearby gold and silver mines and a large number of (retired military) Roman citizens. The church in Philippi was founded by Paul some eleven years before this letter, on his second missionary journey (Acts 16:11-40). This was the first church established on the continent of Europe. Philippians 1 consists of Paul speaking to the Philippians about their partnership in the gospel (their part primarily, but not wholly, through giving, vv. 3-11). Then he lets them know that his difficult circumstances were working out for the advance of the gospel (vv. 12-17) and his confidence that, whether he lived or died, Christ would be glorified (vv. 18-26). Then he encourages them to stand firm and be confident (vv. 27-30). May you and I live much for Christ today. May He be our life, our joy, our treasure and greatest pleasure.